Early Bird Pricing: $3,000. when you pay in full (Discount of $250. off the full price program - register by July 17!) 4 Month Payment Plans Available. * Share your Passion for Yoga! * Deepen your Practice! * Learn from the Best! The 200 hour in-depth yoga training at the Dallas Yoga Center offers a unique opportunity for students to learn the fundamentals of teaching yoga. It provides a comprehensive and deep understanding of both hatha and vinyasa yoga teaching as a transformative practice. Students are encouraged to discover their own voice as a teacher so they can confidently and clearly share their passion and joy for the practice. We welcome students from all yoga style backgrounds to participate. And we encourage students who may not want to teach but genuinely want to dive deep in practice and study. A journey that will not only give you the tools to teach, but it will enhance your relationship with life and living more fully! ~ Get to teach community classes on the studio schedule! ~ 5 Months of free yoga classes at DYC! ~ Discover your teaching voice and express your inner wisdom in a nurturing environment. ~ Learn how to deconstruct classical yoga poses so you have a deeper understanding of alignment, sequencing, and lines of action principles. ~ Directly experience and apply yoga philosophy and yoga anatomy. ~ Learn how to provide a safe space for students to explore the body-mind connection and to develop a continual dialogue between thought and feeling, awareness and action. ~ Deepen your practice! Develop confidence! And have a great time! Upon successful completion of the 6 modules and all the requirements, teacher trainees will receive a letter of certification from DYC and qualify to register with Yoga Alliance at the 200 hr level. The 200 hr level must be completed to take the 300 hour Advanced Training. * 5 month unlimited drop-in yoga class membership & all required reading materials. “I can’t say enough good things about my teacher training experience at DYC. It is the most thorough program from one of if not THE most reputable places. I actually attended the training to expand my own knowledge and practice, not really with the intention to teach. I’ve since started teaching and have an even greater appreciation for the training because of the depth and breadth of the foundation it provided. “Teacher Training at DYC was undoubtedly the biggest catalyst for change I have experienced in my life. The well versed and approachable teachers allowed for a deeper understanding of not only the asana/poses, but the intention with which we practice them. The program allowed for deep self-reflection, and a way for each individual to connect with their unique voice. "Amazing training were I have received exactly what I needed to become a caring and compassionate teacher. We've been nourished, deconstructed, reconstructed for the past several months and I really feel ready to step out into the world and make this dream happen! I'm so inspired, energized and endlessly curious. I'm holding such deep appreciation for all the TT instructors at the DYC. It's been such a transformative and empowering journey. I found the whole format very suitable for my learning experience. All the weekend intensives were so integral to create a solid foundation. All that information became connected and crystallized as I was attending the classes with our unlimited pass. The requirement of attending a certain number of classes was definitely a huge part of really letting everything sink in through experience. The class observations were so informative and suddenly many light bulbs lit up in my head. Especially, after my observations, as I was attending classes for my own practice my mind was just absorbing so much information and going through a lot of sorting and re-organization. Thank you all so much for putting together a teacher training that really works. I couldn't point out any shortcomings, as to me it was exactly how it needed to be. I loved the freedom to find our own voice and the tight group where we could experiment with our unique expression, what it really looks like without any judgement. I'm so grateful for all your time and energy put towards the training." Choosing a yoga teacher training is the beginning of a whole new career and a whole new you! Whether it is your intention to embark on a teacher training adventure in hopes to make teaching yoga your full time job, part-time career, or to deepen your personal practice and learn more about the philosophy of yoga, DYC is here to support you on the journey. Here are 7 things to know about DYC teacher training before taking the leap. 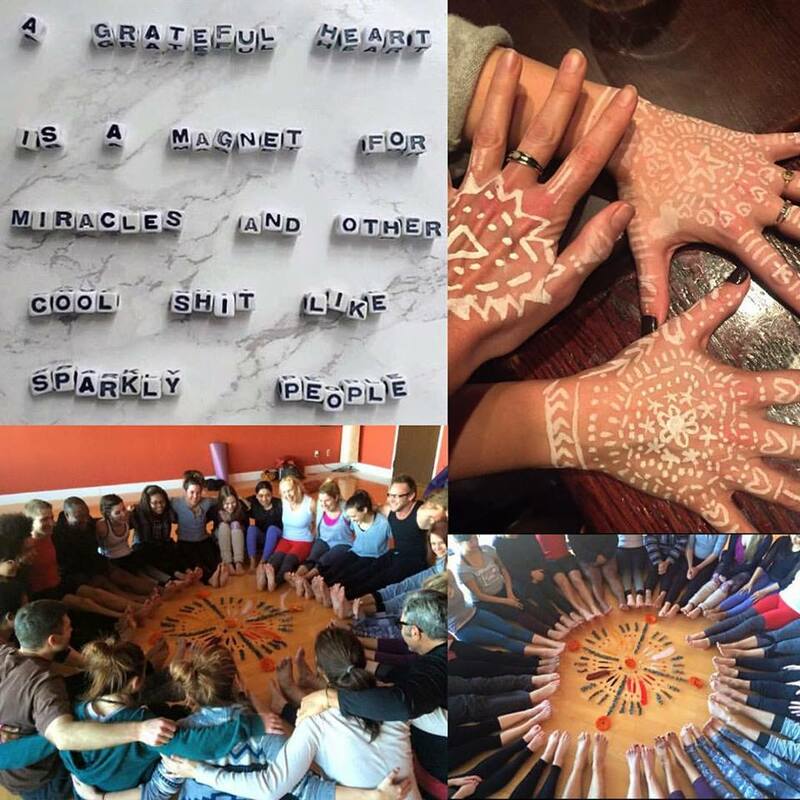 DYC Teacher Training and the DYC team of teachers hope to resonate with you and inspire you. DYC teachers are experienced, passionate about yoga -on and off the mat- and are here to inspire you to dive deep, stretch your edges and to discover more about yourself and the many layers of yoga. DYC Teacher Training takes students from all types of yoga styles and provides an education that explores the depths of yoga as a mind-body-spirit practice. DYC instructors are skilled at providing a foundation for understanding the fundamentals of teaching both asana and Vinyasa. And DYC training covers anatomy, yoga history, teaching methodology and philosophy and highlights alignment principles and how to deconstruct the poses. DYC is dedicated to helping you find your passion for sharing the practice in a manner that reflects your true voice. We do not provide a yoga script. DYC teaches students the basics of sequencing and asana so that students have the capacity to create a class for whatever level they choose. DYC offers students a weekend program taught over five months. We space out the trainings so students can process and absorb the information into their mind and bodies and so that students can dedicate the time to necessary to fully commit to the training. Usually there are between 15 and 20 students in the training. No matter the size, we make sure students feel seen, heard and supported. DYC instructors see that it is important for students to feel that they will be able to connect to their fellow trainees and teachers. Lasting connections and friendships are often forged during teacher trainings. We want students to connect and create community, not get lost in a crowd. After the training is complete there is support. DYC provides continuing education, a mentorship program and many ways to stay connected post training. Plus all DYC Teacher Training graduates receive a 15% discount off the regular price of all the workshops, events and classes that DYC offers. Can’t beat that! !